NOTE: Make sure you are in Small Icon view. At the top right of the Control Panel Window you will see a “View by” drop down menu. Change it to Small Icon if anything else is selected. Click on the “Turn Windows Features on or off” on the left side of the Programs and Features menu. Click the + symbol next to Microsoft .Net Framework to see all the options. Make sure there is a checkmark beside each option. 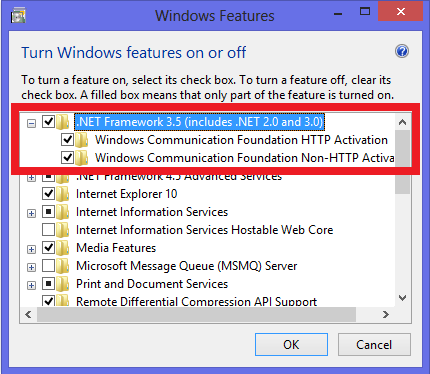 There should also be a checkmark next to “Microsoft .Net Framework” and not a box filled with blue or an empty box. Press “OK” and once the changes have been made restart the computer. If you have any questions or concerns, please feel free to contact us back.